The Town also approved a free pit bull and pit bull mix adoption event for the month of October, waiving the $80 fee, which includes the spaying or neutering of an adopted dog. 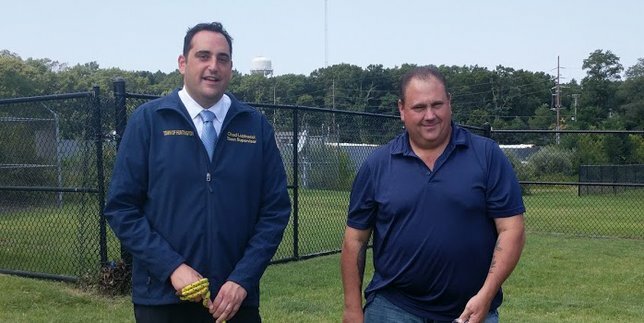 (L to R): Supervisor Chad A. Lupinacci with Jerry Mosca, Huntington Animal Shelter Supervisor. Huntington, NY - Sept. 7, 2018 - At its September 5 meeting, the Huntington Town Board approved a free adoption and spay-neuter event for National Pit Bull Awareness Month, scheduled various public hearings, including a hearing to consider removing size limitations on chicken coops and duck houses. The Town Board scheduled a public hearing for the Thursday, September 20, 2018 Town Board Meeting at 7:00 PM to consider removing size limitations on coops, pens or houses in which chickens or ducks are kept. The Town Board approved a free spay and neuter clinic for pit bulls and pit bull mixes for the month of October 2018, in recognition of National Pit Bull Awareness Month, taking place at North Shore Veterinary Hospital and Little Shelter Animal Rescue. The Town also approved a free pit bull and pit bull mix adoption event for the month of October, waiving the $80 fee, which includes the spaying or neutering of an adopted dog. Both resolutions were cosponsored by Supervisor Chad A. Lupinacci, Councilwoman Joan Cergol and Councilman Ed Smyth. “Each October for the past few years, in marking Pit Bull Recognition Month, the Town has offered free spaying and neutering for pit bulls and pit bull mixes and waived adoption fees at the Town’s Animal Shelter. This has proved to be a successful program that has helped many dogs at the shelter find their forever homes. I hope that this year is no exception, and that these measures will help overcome the misconceptions about the breed and encourage people to consider properly trained and socialized pit bulls as pets,” said Councilwoman Cergol. “I am happy to partner with the North Shore Veterinary Hospital and Little Shelter Animal Rescue to conduct a free spaying neutering program for pit bulls and pit bull mixes to bring awareness to National Pit Bull Month for all of October. Through this partnership we hope to see some of these dogs adopted into loving families,” said Councilman Smyth. Subject: LongIsland.com - Your Name sent you Article details of "Huntington To Offer Free Adoption, Spay & Neuter for Pit Bulls and Pit Mixes in October"